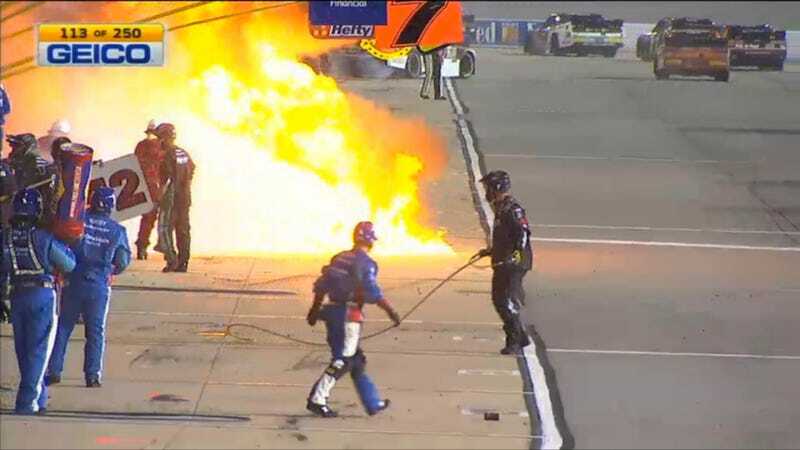 Brendan Gaughan’s pit stall exploded into flame when spilled fuel caught on fire during tonight’s NASCAR Xfinity Series race at Richmond International Raceway. Gaughan’s car even drove off, still on fire. Fortunately, the safety crews acted fast and no one appeared to be critically injured, including the crew member who was right in the middle of the explosion. According to USA Today reporter Jeff Gluck, two crew members from Gaughan’s team and one crew member of Eric McClure’s team were transported to a nearby hospital for further care. The fuel man right in the middle got the worst of it. This is why you heed all the “VISOR DOWN!” nagging during fueling.